Ultimate Fighting Championship (UFC) president Dana White insists that Conor McGregor won’t shy away from bouts outside of an immediate rematch with Khabib Nurmagomedov. McGregor is coming off a fourth-round submission loss to Nurmagomedov back in Oct. 2018. Since that time, the “Notorious” one has been touring all over the world to promote his Proper No. 12 Irish whiskey. Like Nurmagomedov, he’s also awaiting a punishment from the Nevada State Athletic Commission (NSAC) for his role in the post-UFC 229 brawl. White has said that he believes Tony Ferguson is deserving of the next UFC lightweight title shot. 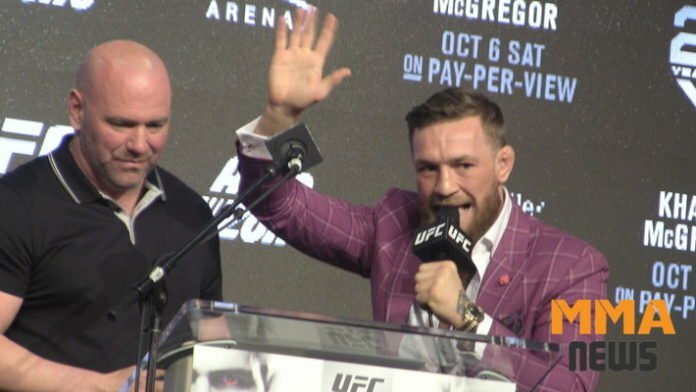 Money does talk, however, and UFC 229 was the biggest pay-per-view in the promotion’s history with 2.4 million buys. If Conor McGregor doesn’t get a rematch with Khabib Nurmagomedov, who would you like to see him face?